ARTIST: Madonna. TITLE: Ray Of Light. 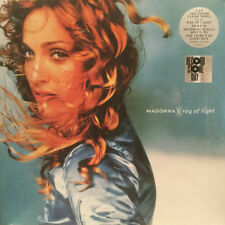 "Ray of light". "Drowned world / Substitute for love". YEAR: 23 Nov 2018. "The power of good-bye". "To Have And Not To Hold". Standard 2nd Class - FREE. VINYL IN EXCELLENT CONDITION BUT HAS LARGE SCRATCH ON SIDE 1. SLEEVE IS VERY GOOD CONDITION. Both vinyl and sleeve are in very good condition. This is Super Limited with only 200 available in the UK. This is on 2 x White Vinyl. All of our Vinyl is professionally cleaned using a Pro-Ject VC-S record cleaning machine. Limited edition 180 gram colour vinyl LP featuring the soundboard recording from the Music LP promo event at London's 'Brixton Academy' recorded live on 28th November 2000 and presented in a cowgirl colour picture sleeve and including 4x collectable stickers with Music era images and two additional bonus live tracks - 1.Impressive Instant 2.Runaway Lover 3.Don't Tell Me 4.What It Feels Like for A Girl 5.Holiday 6.Music 7.Don' Tell Me Acoustic (from Late Night with David Letterman) 8.Music (from MTV Awards , Stockholm) Limited edition with only 200 pressed on Blue Colour In Mint / New Condition. In October of 1992 Madonna released her 5th studio album, the provocative Erotica. Cable Burn-In Service. Vinyl LP Display & Storage. Cardas Custom Adaptors & Cable. Eska - 180g Vinyl LP Lossless Download Code (naimlp213). VINYL IN EXCELLENT CONDITION BUT HAS INDENTS ON SIDE 1. SLEEVE IS VERY GOOD CONDITION. VINYL IN EXCELLENT CONDITION. SLEEVE IS VERY GOOD CONDITION. VINYLS IN EXCELLENT CONDITION. GATEFOLD SLEEVE IS EXCELLENT CONDITION. VINYL IN EXCELLENT CONDITION. SLEEVE IS VERY GOOD CONDITION. FROM THE QUEEN OF POP. LA ISLA BONITA ON EXCLUSIVE GREEN VINYL INCLUDES RARE MIXES. LA ISLA BONITA (EXTENDED REMIX). LIMITED EDITION OF 12,500. New and sealed green coloured vinyl 12" from Madonna entitled 'La Isla Bonita'. La Isla Bonita (Extended Remix). Madonna - Open Your Heart (Extended Version). FROM THE QUEEN OF POP. VINYL IN EXCELLENT CONDITION. 2018 UK Sainsbury's EXCLUSIVE 2-LP set on WHITE vinyl housed in a gatefold sleeve. VINYLS IN EXCELLENT CONDITION. FROM THE QUEEN OF POP. GATEFOLD SLEEVE IS EXCELLENT CONDITION. MADONNA - EROTICA - UK EXCLUSIVE SAINSBURYS LTD EDITION WHITE DOUBLE VINYL. Played once, vinyl and sleeves mint. Erotica: Limited Edition Double White Vinyl. Very limited edition double white vinyl - only 200 copies available in the UK. Madonna/Confessions On A Dance Floor.2005 Pink Vinyl U.S Double LP. A uk 2005 double lp with gatefold sleeve and a condition of unplayed(not sealed). FROM THE QUEEN OF POP. SAINSBURY'S UK EXCLUSIVE. CLEAR VINYL LP. HAS BEEN SLIGHTLY REMOVED BUT THE VINYL IS FULLY SEALED. LIKE A VIRGIN. Sainsbury's exclusive 2018 blue vinyl sealed LP. 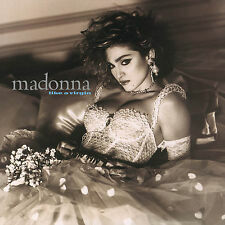 Madonna - True Blue - Blue Vinyl - Played Once. UK limited edition. Sleeve still in shrink wrap. Vinyl and sleeve both mint. 2 x MADONNA 12" PICTURE DISC SINGLES. 2, Limited Edition Interview Disc. 1, A Side,Open Your Heart (extended version 10.33)B Side, Open Your Heart (dub version 6.40) / Lucky Star 5.26. Record Collector Magazine's Grading Guide. Madonna Sainsburys and FNAC Limited edition - Music (blue vinyl) and Erotica (solid white vinyl) sold as a pair. Mint and sealed. Available as a limited edition exclusive for Sainsburys. on very rare limited edition original UK White vinyl pressing 2 x LP in stickered sealed gatefold picture sleeve with paper labels. Here I have a copy of. Limited To Just 200 Copies In The UK and Sold Out At Sound Of Vinyl. This Double White Vinyl Edition Is A Must For Any Madonna Collector. A1 Erotica 5:18. A3 Bye Bye Baby 3:56. Gatefold Jacket Includes Printed Inner Sleeves. 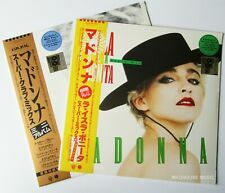 Rare and long deleted Madonna Hard Candy album LP record, manufactured in the US by Warner Bros Records. I ssued in 2008 with catalogue number 470972-1, it remains factory sealed with hype sticker on front. Don't miss out. Mint, new & factory sealed. Causing A Commotion vinyl 12" single. Vinyl is Side 1 Excellent / Side 2 Excellent-. NB Picture discs rarely play as well as standard black vinyl. Poor (P) The record will not play properly due to scratches, bad surface noise, etc. 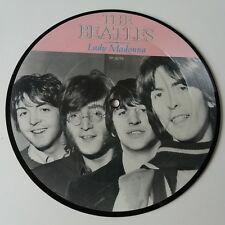 20th anniversary 7" picture disc single in original generic sleeve. Cat No : RP 5675. Format: 7" Picture Disc Single. Record: We be in a new like condition. Very Clean. It may have very, very minor defects such as no more than a couple of very light wispy hairlines and a couple of spindle trails around the centre holes. MADONNA - LA ISLA BONITA - 12” GREEN VINYL. NEW. MADONNA - LA ISLA BONITA. 12” GREEN VINYL. Here's a nice item it's 'Like a virgin' by Madonna pressed on White vinyl. Please refer to the various pictures to really appreciate this item. This is BRAND NEW and UNPLAYED!! Available as a limited edition exclusive for Sainsburys. released on Maverick Records 9362-475865-1 in 2018 originally in 2000. on very rare limited edition original UK Blue vinyl pressing LP in stickered sealed picture sleeve with paper labels. Here we have 4 Sainbury's exclusive coloured vinyl releases of Madonna: Like A Virgin on clear vinyl; Ray Of Light on blue vinyl; and the recently released Erotica on white vinyl, and Music on blue vinyl. Erotica White Vinyl Music Blue Vinyl. Sainsburys Exclusive SEALED AND NEW. This Vinyl is in great condition, from my own collection that has been well looked after. From one collector to another.